The Province o Massa an Carrara (Italian: Provincia di Massa e Carrara), till 2009 Province o Massa-Carrara, is a province in the Tuscany region o Italy. It is namit efter the twa main touns in its territory: Carrara an Massa, its caipital. The province o "Massa e Carrara" wis formit in 1859 frae the separation o the Lunigiana and the Garfagnana frae the Ducato o Modena. 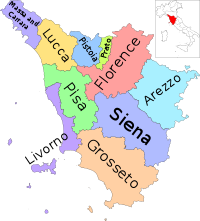 In oreegin it wis composed o three “ Circondari”: I° “Circondario o Massa an Carrara” (compoond frae 7 destricts airticulatit in 14 municipalities), II° “Circondario” of Castelnuovo Garfagnana (compoond frae 4 destricts airticulatit in 17 Municipalities), III° “Circondario” o Pontremoli (compound from 3 Districts airticulatit in 6 Municipalities). The province till the census o 1871 appears comprised in region “Emilia”, but wi the census o the population o 1881 in Tuscany. Later on, wi “Regio Decreto n.1913 o the sept. 2, 1923, the municipalities o “Calice al Cornoviglio” an “Rocchetta Vara” wur detached frae the province, in order tae mak them tae enter in the new province o La Spezia. In same period (R.D n.2490 o November 9 1923) the 17 municipalities o the “Circondario” Castelnuovo Garfagnana wur remuivit them an aw aw that wur assigned tae the province o Lucca in order tae compensate it o the passage tae the new province o Pistoia o aw the municipalities o the Val di Nievole. The province o Massa an Carrara remained thus crippled waitin for a its reorganization. 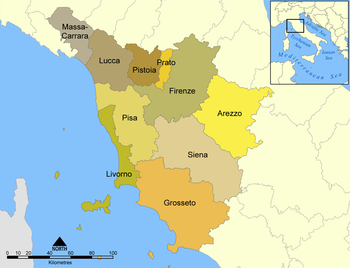 In the 1938 the Municipalities o Carrara, Massa an Montignoso, came fused nell' anerlie municipality o Apuania. In that same year the industrial zone Apuana wis institutit (includin in relative Consortium C.Z.I.A an aw the Municipalities o the Versilia neebour) an the province assumit the name o province o Apuania. In the 1946 wi decree Liutenant ane (Umberto II o Savoia) the new Municipality o Apuania wis meltit an the province (for error an/or historical ignorance) resumptions the denomination does no date frae 1859 when it wis "Massa an Carrara" but Massa (name wi which it came designatit tae the ceety o Massa or Massa o Carrara frae 1700 till Kinrick o Italy (1860), denomination that, in order tae distinguish it frae the ither homonymous ceeties, the chief toun continued till the institution o the unifeed Municipality o Apuania) an wi same the decree liutenant were placit tae Massa. In 2009 baith decrees o 1938 an 1946 wur abolished, restorin the auld name. The province's economical relevance, ance mainly based on the production o the famous white Carrara marble, haes nou shiftit tae the importation an fabrication o blocks o marble an granite frae aw ower the warld. This page wis last eeditit on 10 Mairch 2018, at 22:26.